A strategy game in the climates of science fiction integrated with the social networking site facebook. We create a colony inhabited by friendly strangers called Starling. 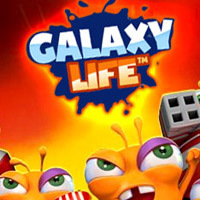 Intriguing planets, weird and wonderful characters; challenge friends and find allies in Galaxy Life! Lead your Starling colony to victory in the wackiest space strategy game yet. Your little guys may be cute and playful, but when it comes down to brass tacks they don’t mess around. Diplomacy is admirable but battles get you the booty! Game score 9.1 / 10 calculated out of 97 players' votes.